Did you know that well over 21,000 people in Toronto’s Jewish Community live below the poverty line and spend between 50 to 70% of their low incomes toward rent? 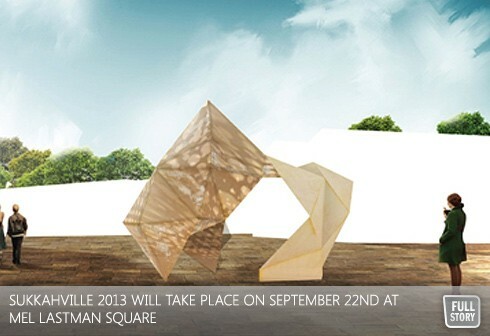 Sukkahville 2013 is an international design competition that will culminate in a Pop-up Design Exhibition, raising funds and awareness about affordable housing. It is the brainchild of the Kehilla Residential Programme, whose mission it is to champion and provide affordable housing for our Community. Kehilla is the official housing agency of UJA Federation of Greater Toronto. Building on two previous years of success, submissions have come in from as far afield as Cyprus, making it a truly international event. Architects and artists, design professionals and students, individuals and teams, vie to have their designs chosen for a Pop-up Design Exhibition. Six finalists have been culled from over 80 submissions by a panel of celebrity judges and given a stipend with which to erect their structure. The winner will be chosen and finalists displayed at this family event, September 22, 2013, 2:00 - 4:30 pm at Mel Lastman Square, 5100 Yonge Street. The interactive experience will feature a hands-on build opportunity by Habitat for Humanity, live music by Klezconnection, an urban agriculture display and mobile food market by FoodShare, free snacks and more. Walk through the structures, meet the artists and learn some surprising facts about affordable housing. The event is free of charge and open to everyone. Support for Sukkahville comes from corporate sponsorships and private donors including the Ira Gluskin & Maxine Granovsky Gluskin Charitable Foundation. Greenwin and Verdiroc are lead sponsors this year. All money raised will be directed to Kehilla’s rental assistance program. A Sukkah is the name of the symbolic temporary dwelling celebrated during the Jewish festival of Sukkot and mentioned in the bible as shelter in the wilderness. It also connotes welcoming strangers or those in need to share from the bounty at our table.Sukkahville uses the concept of temporary shelter to work toward a permanent solution for affordable housing. For more information visit www.sukkahville.com.